Right! We spend too much because tax rates are too high on the rich. Good logic. We spend too much because 50% pay no taxes. Therefore they demand more benefits and wield power with their votes to force the politicians to comply. Yes it is good logic- once you comprehend what I said. You shouldn't get a break for donating money. Donate because you care or don't. We shouldn't subsidize your house. Buy a cheaper home. The entire credit for mortgage should be eliminated. We can write the rules however we want. The beef, of course, is that by making such a huge change all at once, you've pulled the rug out from under people who made decisions - such as the one to buy a house at a certain price point - based on the way things had been for a number of years. That's not good public policy, especially since you're transferring money from people's pockets who are going to spend the money to people who are going to stash the money in a Swiss bank account. As I've said before, I might as well just write a big check to one of my friends who lives in North Oaks or to the CEO of General Electric. I would have been fine with a tax increase to reduce the deficit, but this makes poor use of the increased revenue. That's why this will ultimately be a loser for the U.S. economy. Personally, I'd wait to see. He might start caring about it any day now. Let's not rush to judgement. Rules can change anytime. That's on you for not considering the risk. Live below your means. You can send me your taxes directly via money order if you'd like. I'll tell the IRS that you paid up. "Per attendee"- well there you have it. That's reliable- since we know that no one would ever want to damage Trump's message. The reality of the situation is that everyone knows that Congress will refuse to deal with it. They didn't when Obama ran up 10 trillion in new debt and they won't now. It doesn't matter much who is involved. The Rs have no guts and the Ds want to spend more. Medicare for all. Free college. Etc. "But it must include real, structural change to end unfair trade practices, reduce our chronic trade deficit, and protect American jobs." The speech did include a call for legal immigration in record numbers, though, so you have that going for you. I know you're trying to be snotty for the sake of snottiness, and this is the internet, so ya. But the point is that the risk of a middle class person's tax burden increasing this much (four figures in my case) in one year due to a change in the tax code is something that, to my knowledge, has never happened before in American history. That's simply a risk that even the most conservative person wouldn't consider accounting for. It took Trump and the Republicans to make such a wacked-out situation come to pass. Why even bother talking about it? Congress can't even open a debate about an issue that requires the equivalent of 8 hours of spending (the wall) in order to save hundreds of billions over several years. There is only one way to get at the deficit and that's cut way back on entitlements while stoking an amazing economy that drives revenue and reduces dependency. Trump is heading that direction with the economy. Cutting back on entitlements? NO WAY. The Rs are afraid and not serious. The Dems want to ADD huge new entitlements. Maybe Trump should have talked about finding a way for everyone to live to 150 years old. It's about as likely. Remember that when you're shrieking about budget deficits the minute President Klobuchar takes office. Justnofacts posts about trade. Obama did nothing justnofacts. Nothing. You really enjoy the USA being ripped off. So does Obama. Maybe someone can read it to you. Last edited by Sportsfan24; 02-06-2019 at 06:29 PM. I guess maybe I shouldn't feel so bad. 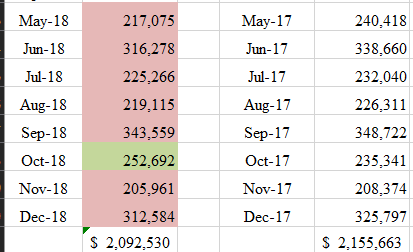 My federal tax is up only 25% over last year. Check out #TaxScamStories on Twitter...if you dare. As of a couple days ago, it was trending. Bear in mind these are nominal dollars. Inflation was at 1.9% for that period. So if nothing else changed, individual tax revenues should have gone up to $167B. Can we get an estimate on when tax revenues are going to start increasing?